I am very lucky that my job affords me the opportunity to attend a lot of fiber events, but one experience I’ve never had is going to a big event as a yarn civilian. 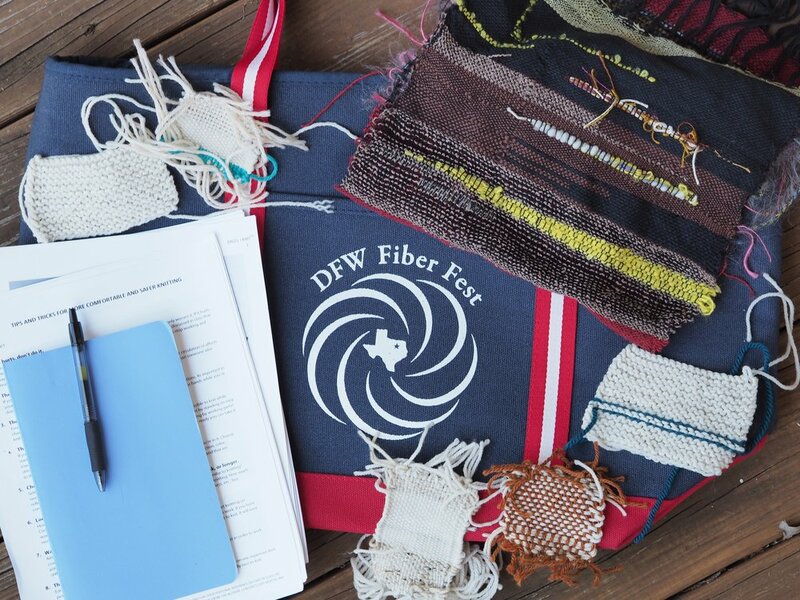 So, when I saw the teacher line-up for this year’s Dallas-Fort Worth Fiber Festival I decided to take the plunge and sign up. I had a full weekend of classes (7 of them!) and managed to sneak in some marketplace time as well. Here’s some of what I learned during this lovely weekend. These are my swatches from Knitting for Speed and Efficiency with Stephanie Pearl-McPhee (bottom) and My Aching Wrists with Carson Demers (top). In the former class I learned a ton about the history of knitting before we talked about how we can improve our personal knitting rate. It was interesting to take at this particular time in my life as a sick person, because the disability community talks a lot about not measuring our worth in productivity and my brain was really trying to figure out how to hold onto an interest in knitting quickly with not feeling like it reflected on me. I learned that I knit 28 stitches per minute, which is mid to top of the average range for North American knitters: 10-40 stitches per minute. We talked about a very efficient way to knit if we’re willing to learn a new technique, as well as ways to increase speed in our current knitting style. You can’t really practice both, you have to pick one, and I’m still undecided which I’ll do when I’m done with one of my current projects and am ready to take on a speed-practice one. I put these swatches together for the picture because they both show the same tendency - when I start practicing a new knitting technique my gauge gets smaller. I am a very loose knitter, often needing to go down 3 needle sizes to get gauge, and I finally learned why in Carson’s class. When I make a stitch I do so on the shaft of the needle, so my stitches are the diameter of two of the needle size, not one like it would be if I formed the stitch on the tip. I don’t have a problem with being a loose knitter so I’m not sure if I’ll attempt to change this practice of mine, but it is nice to understand why I have to knit on such tiny needles. I also took my first two weaving classes this weekend - Knitting for Weavers with Deborah Jarchow and Saori Weaving with Kathy Utts. Above are my samples from the former class. It was such a great set up - there were half a dozen different types of beginner looms in the class. We each warped the one in front of us and wove a sample on it, and then moved around the room and tried out other looms we were interested in. It is amazing how different the models can feel in your hands, and how tiny style differences make using it harder or easier for your body. During the entire time we were warping I was thinking how glad I was that I took a class and didn’t just buy a loom, because this activity was not for me. And then the moment we started weaving, as I saw cloth being created in front of me, I had such a visceral reaction - I was part of an ancient textile art, sisters with the Goddess Arachne. Now that the fumes have worn off I’m still not sure I’ll take it up as a hobby, I don’t know if I have the mental energy to properly learn a new kind of making, but I also don’t know if the siren call will overwhelm my senses at some point. My favorite class experience was definitely Saori weaving. I love everything about the philosophy - it is about creating imperfect art and knowing ourselves in the process. Sitting at that loom felt so good, as did playing with techniques and making up my own. The Saori way is to machine wash your weavings, which puts fear in my stomach but I am going to do anyway to really go through the process. After that is done, I cannot wait to hang this piece that I love in my office. It’s definitely not in my budget to buy a Saori loom anytime soon, but I may visit the local studio and take some more classes. I can’t believe it, but I didn’t take any pictures while I was there! So just imagine a picture of a great marketplace full of interesting vendors. I also really liked the hotel/conference center set up - they’re across the street from each other and right next to a bunch of restaurants. My favorite was Nosh and Bottle, a deli/market. I had one of the best sandwiches of my life there and will definitely eat there again next time I’m in Dallas. Maybe for next year’s show? If so, hopefully I can convince some of my knitting group to come with me!